Discussion in 'Off Topic' started by Adora, Apr 15, 2019 at 2:54 AM. I have this reaction when I sometimes drink alcohol and I get a electric shock type of pain within my jaw,I have had this for a few years now and it can be very painful at times, I tried googling it but nothing seems to give me a direct reason for it though there is a condition I consider could be linked to it which is tmj,I just wondering does anyone have a similar reaction and do you know what may cause it. Or at other times too? Eating? Brushing teeth? Hot or cold substances in mouth? Have you experienced popping, cracking or grinding sounds when moving jaw? Can you open mouth wide enough every time you go to take a bite? Have a dry or watery mouth usually? You don’t have to answer these questions on an open forum, only to yourself. I have something going on around the mandibular division of the Trigeminal nerve in my own jaw. I now have a lump between my ear and cheekbone but no longer experience those shocks you describe. A dentist or a doctor? Mostly alcohol though I sometimes get it slightly without alcohol,another thing is I am a night time grinder and think maybe it has done something to my jaw. (Me too) - can’t keep a mouth guard in for whole night, end up spitting it out during sleep. I would have thought the mouth has to open wide unless sipping drinks through a straw? Have you watched the you tube animation of how the disc gets displaced and over time a Sudo disc takes its place? I might have had tmj for a while if that is indeed what happens. What causes it is drinking alcohol. So why do you keep doing it? The shock sensation sounds like some nerve related issue or TMJ (especially since you grind) but the link to drinking is baffling. One for the doctors it sounds like. Unless the alcohol is stimulating that nerve somehow. Oh - I typed into my search bar 'can alcohol cause nerve pain', and top of the page was this. (copy and pasted: Drinking alcohol can cause sudden stimulation of salivary gland. As it is blocked, it may enlarge in size and press the facial nerve passing beneath it. Facial nerve is innervated in the jaw muscles. Irritated nerve leads to contraction of jaw muscles triggering pain. 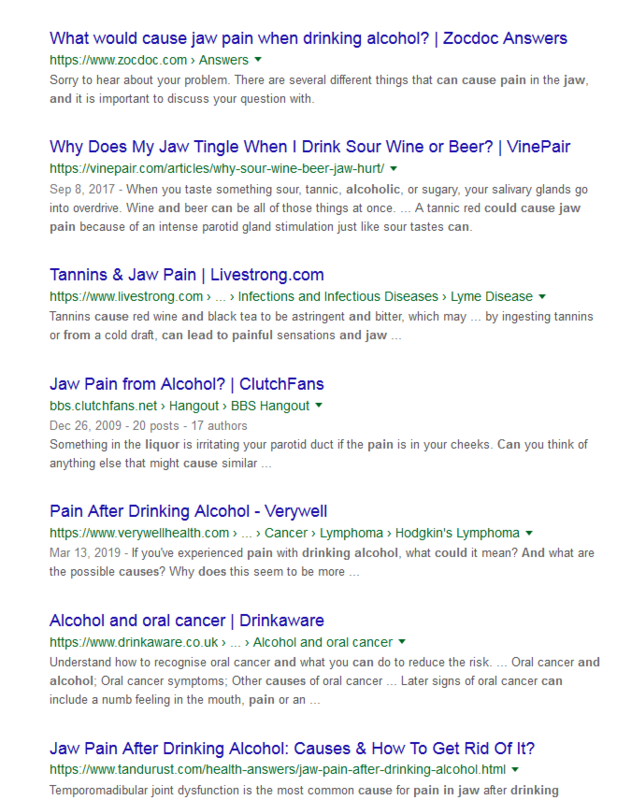 I used the search phrase: "can drinking alcohol cause pain in jaw". These were the first 7 resulting links I got. This is a sample of the links to various articles explaining the cause of the pain. I had the same problem several times but without drinking alchohool, I dont know what causes it. Alcohol only gives me jaw pain if I happen to fall down from drinking. You forgot the end of your sentence..
Definitely a medical doctor or nurse practitioner. A few years ago I had a sinus infection that "migrated", affecting my right parotid gland. They simply prescribed me an antibiotic (Amoxicillin), and emphasized consuming sour things to stimulate salivation which is good for the parotid glands. Took about four days before all the swelling and pain was gone. On a side note, parotid gland issues involving alcohol are a more ominous sign that may involve the liver. Sounds like something I'd go to the doctor about. Better be safe than sorry. duh, l don't know.....what now?